Some of my friends wanted to see an aurora and the result was that a party of eight “nutters” went to Iceland for a weekend. We managed to pack quite a lot into the short time we were there and returned somewhat exhausted. Nick has written some excellent web pages about the trip. When I get time I intend to select a few of my better photos to display here but for the moment I’ve just uploaded previews of them all (67 photos, total about 950kB). For the Landie enthusiasts; I did spot a few of them but didn’t manage to get photographs except for this one of a Rangie in the lower car park at Gullfoss. 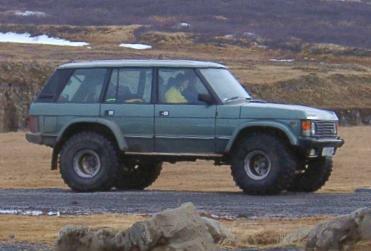 The tyres are slightly on the small side for an Icelandic 4x4! The same group who did Iceland in March, together with a couple of extra nutters, went to Malta in September for a rather more relaxing holiday. Once again Nick has done a great job of documenting what we did get up to. A group of 13 went to Alderney for a week. We stayed in Fort Clonque, originally a Victorian fort which was used by the Germans during World War II and is now owned by The Landmark Trust who restore historic buildings and let them for holidays.